gracious living in an upscale urban environment. Pictures are from the sister building at 3326 W Irving Park Road. Finishes and look will be very similar. Welcome home to 3320 W Irving Park! Surrender yourself to a little piece of heaven, where comfort and luxury await to sweep you off your feet and wrap you in its finest creative innovation. From the moment you open the door of your new home you will be delighted with soaring 10' ceilings, skyline views from the Penthouse through floor to ceiling windows and beautiful hardwood floors. 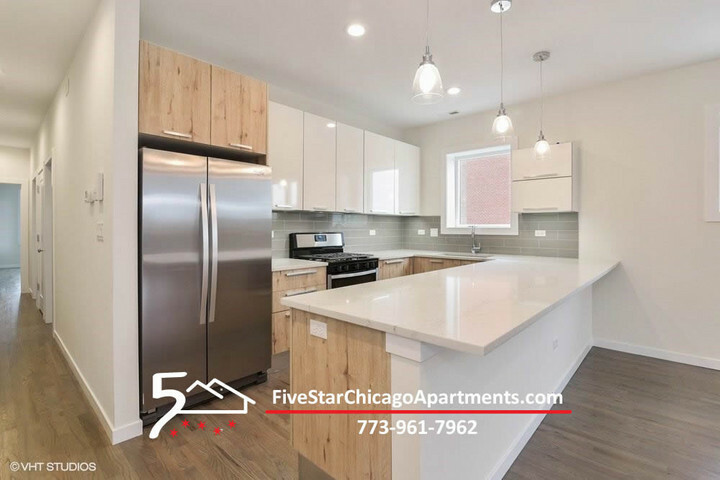 We boast upscale finishes which include quartz countertops, stainless steel appliances and porcelain tile baths. We feature large open layouts in our 3 bedroom apartments including master suites, and terraces for your outdoor enjoyment. There is a penthouse units that includes a private rooftop with views of downtown and 3 bedroom 2 bath apartment homes. You will love being able to stroll out the front door to one of many neighborhood restaurants, pubs or the theater. You are just minutes away from the thrill and excitement of downtown Chicago; home of the best shopping, dining and entertainment worldwide! Call us today to schedule your own personal tour and experience superior customer service that is second to none and sure to exceed your expectations. We would love to show you 3320West's distinctive floor plans. Enjoy life to the fullest in your new home at 3320West.